326 pages | 65 B/W Illus. 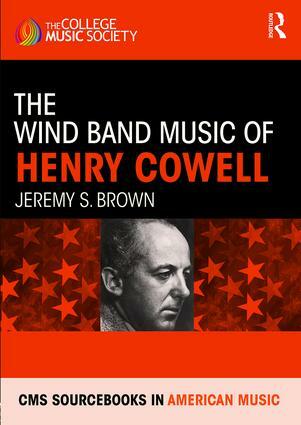 The Wind Band Music of Henry Cowell studies the compositions for wind band by twentieth-century composer Henry Cowell, a significant and prolific figure in American fine art music from 1914-1965. The composer is noteworthy and controversial because of his radical early works, his interest in non-Western musics, and his retrogressive mature style—along with notoriety for his imprisonment in San Quentin on a morals charge. Eleven chapters are organized both topically and chronologically. An introduction, conclusion, series of eight appendices, bibliography, and discography complete this comprehensive study, along with an audio playlist of representative works, hosted on the CMS website. "Crystal Set" and "Quaint Minuet"
"The Exuberant Mexican: Danza Latina for Band"
"Animal Magic of the Alaskan Esquimo"
Jeremy S. Brown is Professor of Music at the University of Calgary and the lead compiler of the Royal Conservatory of Music's inaugural Saxophone Series. The CMS Sourcebooks in American Music series was conceived to underscore the remarkable diversity in our nation’s musical expression and to call attention to both landmark and representative achievements in its evolution. Whether the subject is a concert or stage work communicated through a notated score, a virtual performance frozen in time by modern technology (such as a film score or a recording), or some other mode of preservation not yet invented or standardized, the goal is the same: to gather materials for study, to reconsider and synthesize existing commentary and criticism, and to offer a fresh assessment or appreciation. These carefully written and engaging studies are fully documented, and are directed to teachers of music, students of music, and other lovers of music.